Preheat oven to 375°. Place a 28x18-in. piece of heavy-duty foil in a 15x10x1-in. baking pan. Place onion slices in a single layer on foil. Top with salmon; sprinkle with salt. Arrange orange slices over top. 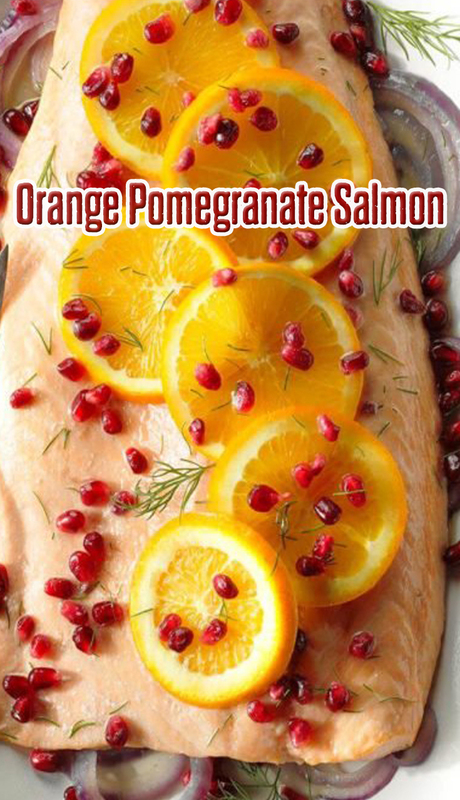 Sprinkle with pomegranate seeds; drizzle with oil. Top with a second piece of foil. Bring edges of foil together on all sides and crimp to seal, forming a large packet. Bake until fish just begins to flake easily with a fork, 25-30 minutes. Be careful of escaping steam when opening packet. Remove to a serving platter; sprinkle with dill.